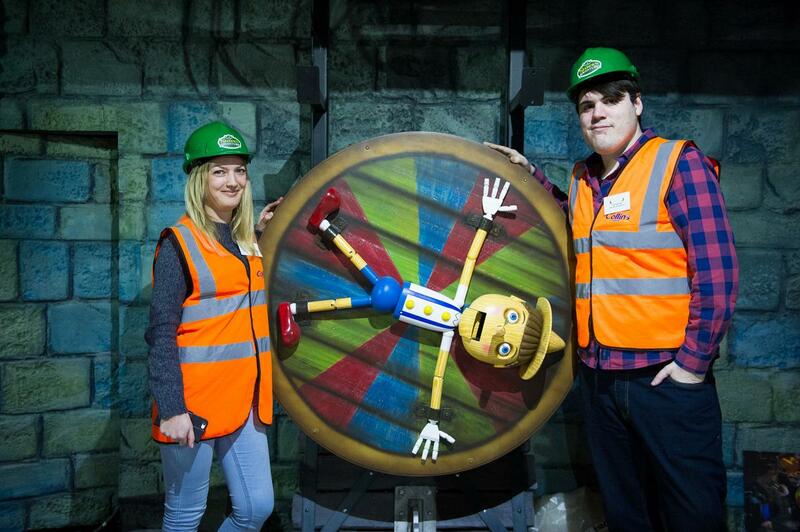 Merlin Entertainments has revealed new details about its upcoming fully immersive Shrek’s Adventure attraction, which is set to be rolled out worldwide following its July 2015 debut in London’s Grade II Listed County Hall. Collins-construction is working on the project build, which has been designed not to impact the listed building. “We’ve built into the rooms so as not to damage the existing building,” said Eddie Saul, creative lead for the project speaking exclusively toCLAD. “Rumplestiltskin’s Carriage used to be (former London Mayor) Ken Livingstone’s office, so it’s changed quite a bit! Merlin has also enlisted design and manufacture company Scruffy Dog to work on the project, while London-based MDM is working on props and models for the attraction. Merlin’s in-house Magic Making team is overseeing the entire development from start to finish. 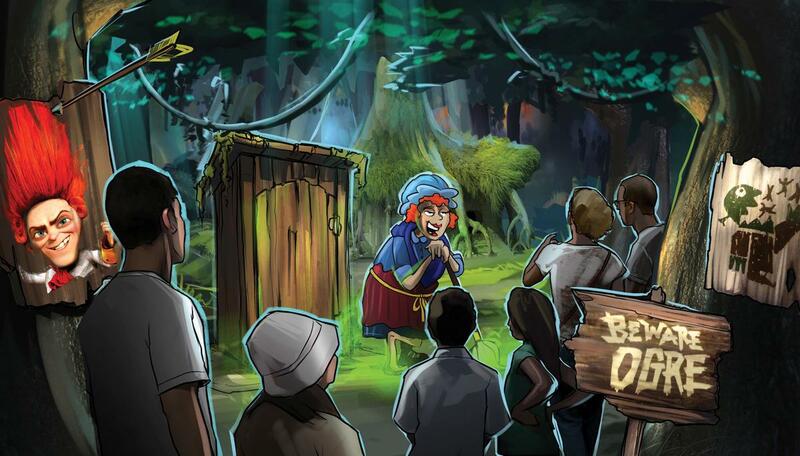 Working in conjunction with DreamWorks Animation, the immersive story will follow a similar format to that of the London Dungeon minus the frights. Starting at the ‘Far Far Away Bus Depo’, visitors will be transported to the fairytale world with the help of a 4D experience by Simworx. 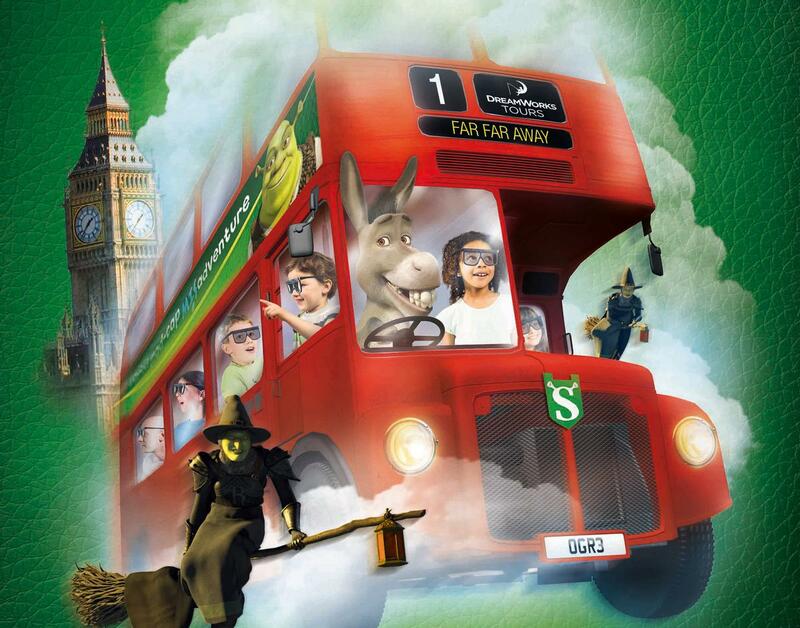 With Donkey in the driving seat, the immersive flying bus ride combines state of the art technology, brand new DreamWorks 3D animation and multi-sensory special effects. 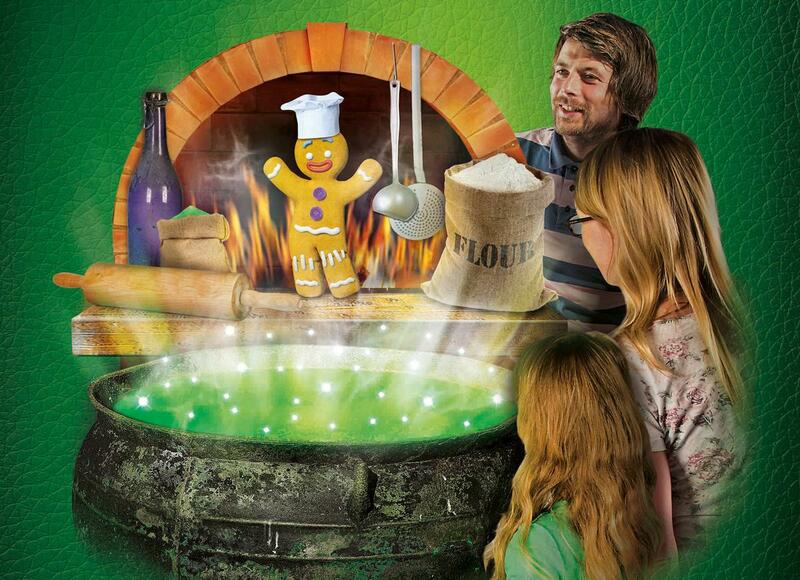 Following a crash-landing in Shrek’s swamp, visitor’s will find themselves in Far Far Away. 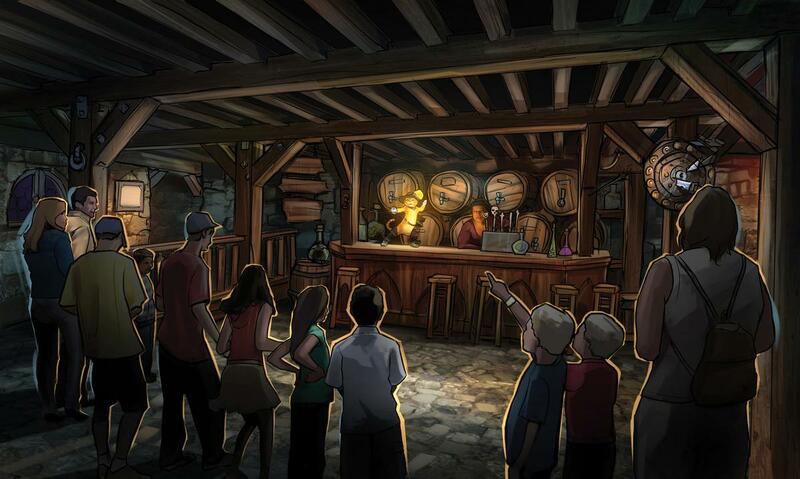 From there the walk-through attraction will take guests to iconic locations in the Shrek universe, including Spooky Forest, Rumplestiltskin’s Carriage, the Poison Apple Pub, Game Show Studio Torture Chamber, the Magic Mirror’s Maze and Muffin Man’s House. After leaving Far Far Away and escaping the clutches of Rumplestiltskin with the help of Shrek, guests will be returned to the DreamWorks Tours Arrivals Hall. Here they will be able to get a look at other popular characters from the DreamWorks realm, including those fromMadagascar, Kung Fu Panda and How To Train Your Dragon, with one of the most impressive features of the Arrivals Hall being a nine-meter-long model of Toothless the Dragon and his companion Hiccup. Speaking to CLAD, Saul – who also operates as creative lead for all of Merlin’s highly popular Dungeon experiences – explained how the immersive Shrek-themed version would be a step up on what was currently on offer. “To put it into kind of its basic format, we describe them as batch linear experiences,” said Saul. “What that means is they are a way for people to go on an experience and feel like they can influence a story. If you go round a Dungeon, you can go and think that’s the first time the show has been like that and often it is – they’re kind of spontaneous. Saul also said that the script for the experience – which will last around 1.5 hours – was completely new and has been written exclusively by DreamWorks for the multi-million pound project. “We’re not rehashing anything from any of the films and once they’d nailed out that script, we took those words and developed them into a visual concept for them to sign off on,” he continued. “DreamWorks have been very visual people so for us to have it in storyboard form for them to get by in that way has been very useful. Once that concept was bought into, we’ve then looked at all of the actor elements and all the costume designs done in partnership with them. 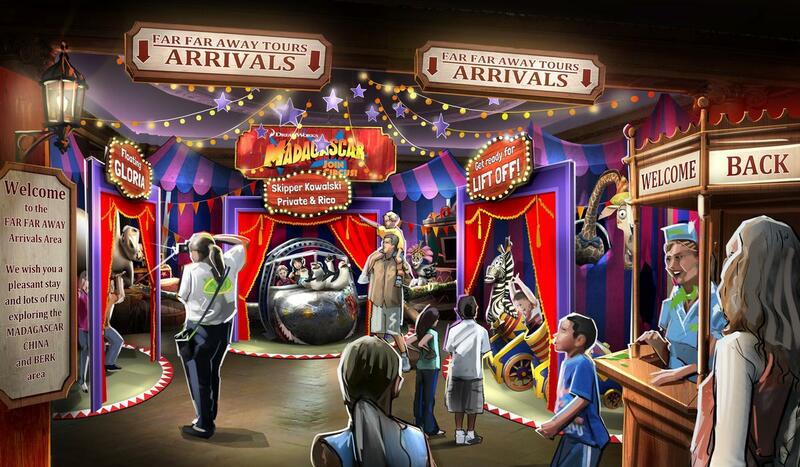 In the Q3 2014 edition of Attractions Management Merlin’s chief development officer, Mark Fisher, revealed that the deal between Merlin and DreamWorks would see six Shrek-themed midway attractions developed worldwide. Saul elaborated on how those would differ.